i may have the sequence of events slightly askew, but if memory serves correctly, the original series of star trek opened with the words "space. the final frontier...". in the context of this introduction, there really was no doubt over which definition of the word 'space' was being used. and in direct contrast to all we've learned about contemporary space travel, the interior of the uss enterprise seemed possessed of acres and acres of extravagant space, despite having a sizeable complement of crew. but in all the episodes filling the three-season run on america's nbc, and across all the various planets visited by those who boldly went where no man had gone before, i don't recall seeing even one bicycle. odd, when you consider how advanced this future was alleged to be. not even was there a vehicle that could be seen as a futuristic derivative fo the humble, yet highly efficient velicipede. of course, it's always possible that the fourth series that was never made would have introduced us to the enterprise's cycle bay, just a corridor's length from the oft-used shuttle bay. and no doubt, given the plentiful space that seemed to abound in the nether regions of the spaceship, and despite it's full stock of dilithium crystals and anti-matter engines, there would have been little need to consider alternative means of storage for those interstellar bicycles. unfortunately, that's a problem that has not escaped the attention of many of us. i have the luxury of a severely dilapidated bike shed behind the house which, despite an endless array of forgotten cardboard boxes, a lawnmower, two track pumps and a workstand, still affords space for the panoply of washingmachinepost bicycles, with one empty space reserved for review models. my good friend grahame is not quite so fortunate, having need of space for bicycles belonging not only to himself, but those for the rest of the family. 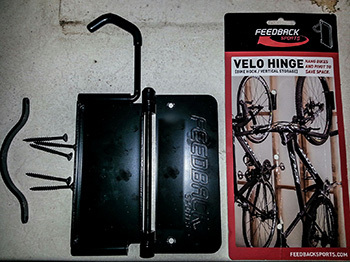 therefore when edinburgh distributors 2pure were kind enough to send a velo hinge manufactured by feedback sports, it seemed the only decent thing to do was to pass the hinge over to grahame and at least partially solve his final frontier problem. that, and the fact that he's far more of a dab hand with diy than i'll ever be. the screws supplied with the velo hinge were, in this case, put to one side and substituted with 30mm screws because the panel to which it was being affixed had cables and a window on the other side. it took our intrepid space man (see what i did there?) about 20 minutes to fit the hinge to the designated panel using the straightforward instructions. 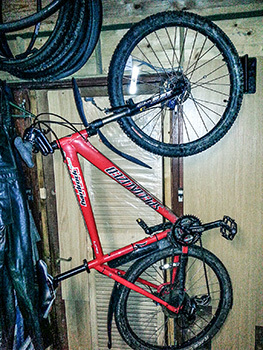 when in place, grahame had the benefit of the two different means of storing his bicycle (in this case, a specialized mountain bike) offered by the velo hinge. 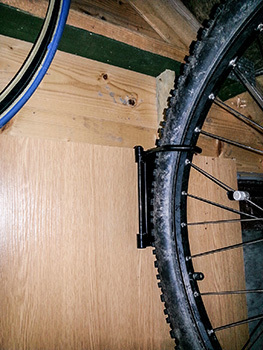 when closed against the wall, the front wheel is lifted onto the protruding hook, holding the bicycle vertically, saddle towards the centre of the room. 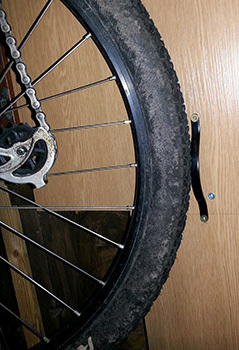 open the hinge, and that hook now runs parallel to the wall, and a bracket strategically placed lower on the wall to meet the rear wheel allows the bike to sit flat(ish) against the wall, especially if you loosen the stem bolts and turn the handlebars through ninety degrees. if you've endless amounts of space available for your substantial collection of bicycles, this is probably not a device you'll find great need of. but if your living quarters or bike shed are a tad on the compact and bijou side, this might be the very solution, particularly in light of its economic selling price of around £30. it might even be possible to sell its virtues to any employer who feels that work premises have no need of being encumbered by wayward bicycles. it's a well-made product that works in a simple, yet efficient manner and does exactly what it says on the packet. and when sitting unrequired, the hook folds neatly and unobtrusively inside the hinge, substantially lowering the clutter factor.